So is monsoon a great time to plan a trip to Darjeeling? If you want a single line answer from me, I'd have to say... 'It really depends on eyes of the beholder'. It's a fact that vast majority of tourists won't even look at Darjeeling as a tourism option in Monsoon. Why? Because it rains almost incessantly during this time and you can hardly see the sky, leave alone the sun. That is not to say that the sun does not appear at all. It does, but almost inevitably when you are not prepared to take a great camera shot, and by the time you are, it disappears. Monsoon in Darjeeling essentially sets in from June and continues till August and sometimes beyond. You may even encounter showers during May and October. Another reason why most tourists avoid the time is because they all come here to view the Kanchenjunga snow peaks. Unless you are strangely lucky, you won't be able to view that because the sky remains mostly cloudy or the day remains too foggy for such views. Another negative in monsoon... Sorry I'm pouring in only negatives for now, but just hold on till I finish the apparent facts and then I'll come to the sides not easily known or felt by the tourists. So the other negative... during this time there is no point taking local sightseeing tours. 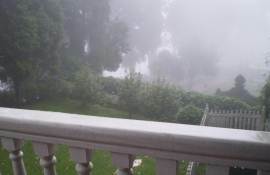 Because from most of the view points you will only see fog, rains and cloud. Sometimes there are also landslides in Darjeeling during monsoon which may cut off some road routes. But that is usually not a big problem because one can usually take alternative routes. However that may take lot more time to reach the destination due to road conditions and traffic. Very seldom there has been a disaster out of landslides. All those negatives I mentioned so far are only for the chicken hearted persons or those who can't see a vacation beyond sunny days, tours and views, and can not accept a change. Let me tell you that I have seen Darjeeling through many different seasons and monsoon in Darjeeling is as dear to my heart as any other season. 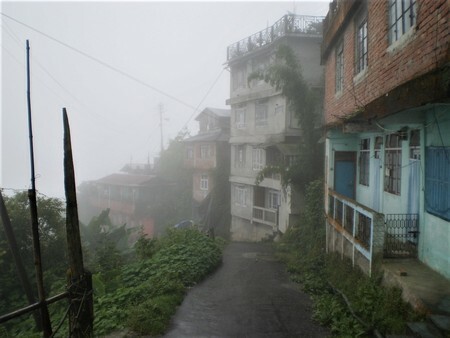 But one of the most awesome sights of Darjeeling during monsoon is the play of the mist or the fog. You can see the mist coming and covering the entire place with a foggy white blanket. You can't see anything even a yard away. And suddenly in no time, it's all gone. It gets bright and clear once again, leaving behind stretches of moist roads and landscapes. I doubt if you can witness such shows of the nature anywhere else in the world. See the two pictures below. And in seconds, the mist is gone! I took the above two pictures in Monsoon from Windamere Hotel in Observatory Hill located just above the Mall. The scene change took place within few seconds. This is Darjeeling in Monsoon! Sun and the mist play such unbelievable hide and seek all through the day. This alone is worth a visit to Darjeeling during the monsoon time. Another great sight that I love during monsoon is of school children in their oversized raincoats and wearing gum boots (up to knee level) with colorful umbrellas, some of them trying to squeeze in with the other under the same umbrella while torrential rain almost drenching them both. When you settle in for a while and look at the locals, you realize that rainy days are just another normal day in the hill town when business is carried out as usual. All shops and establishments remain open even if there is continuous pouring. Just take an umbrella and you are all set. After all unlike in the plains, water logging does not take place in hilly terrain. If you drive down the streets like the Hill Cart Road, you will see many springs & waterfalls with roaring gush of snow white water in their full flow that you can rarely see any other time. If you like to take home one of the greatest posters of a misty morning in Darjeeling, then see the picture below. 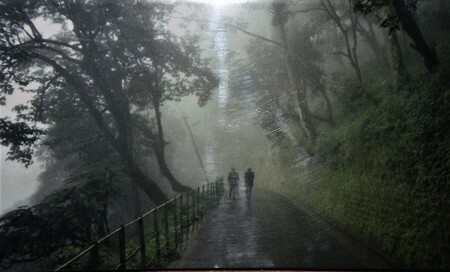 It captures a mystic Darjeeling with two men taking a stroll along the Mall road in shades and lights of a foggy morning and just after the rains. You will get this fantastic poster at Das Studio located on Nehru Road that leads to the Mall. It's one of their greatest and oldest collections. It's magical and I have it framed up on the wall of my living room. I myself tried to take a picture of the same place on a misty morning during a recent monsoon. You can see it below and compare. Of course I don't have the two mystical men in my picture and with time taking its toll, the trees and vegetation around do not look exactly the same. 1) Go down to Keventer's in the morning, walk upstairs and take a seat by a window-side table indoor. Order for some sandwiches, meatloaf or sausages and Darjeeling tea. There are couple of tables facing the valley and others facing the road. Take a sip, bite the sandwich and relish the misty view of the valley that takes you to a trans state. Or look at the road below and simply enjoy how so many colorful umbrellas cross each other as the rain falls from above. 2) Go down to Sunset Lounge in Chowraste Mall. Again take a valley view table, order for fine Darjeeling tea, listen to some great music and read a book while enjoying the scene of rain fall on the valley. If I have my laptop with me, this is a great time to catch up with mails or be on a chat with friends. Wi-Fi internet is free in the lounge. 3) Go down to a Monastery in the morning or late afternoon and join the prayers with the lamas. With the Buddhist chants, rings of the bells and a true sacred ambience, it feels heavenly as if I'm one of them and one of real Darjeeling. 4) Enter one of my favorite shops (could be a curio shop or a studio, or just a tea stall) and chat with the owner. Other times these locals have no time to spare due to high tourist demands. Now they have all their time and smiles to offer. The time flies as we get into discussions about life in Darjeeling, its future, the political shape it might take and lot more. 5) If it's not raining heavily, I would Drive down towards Mirik and enjoy the lovely tea gardens in the mist, spend the day with the nature and come back. For me, It has always been a pure bliss to be in Darjeeling during Monsoon. 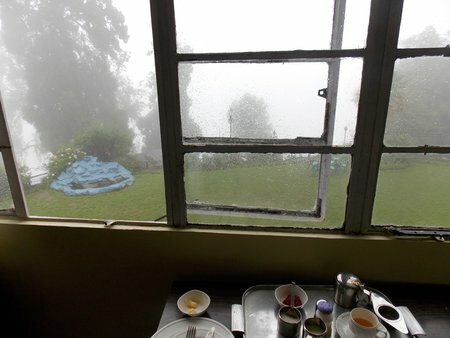 Here are some indoor places in Darjeeling which you can visit and enjoy even during monsoon. You should ideally take a reserved car and carry an umbrella. 1) Bengal Natural History Museum - flora & fauna of the region. 2) Japanese Temple & Peace Pagoda - Needs some walk from the main entrance. 3) Tibetan Refugee Self Help Center - need to walk between various workshops. 4) Some of the great monasteries - some will require walks. 5) Ava Art Gallery - great collections of paintings and artwork. 6) Hayden Hall - an institute working for the underprivileged and has a sales outlet. 5) Nature at its best ... green and lush foliage. June, July and August are usually the peak monsoon time in Darjeeling although it can stretch well beyond to September. The average temperature during monsoon ranges between 13°C to 19°C. However in the evening and at night, the temperature can fall and it can get quite cold. 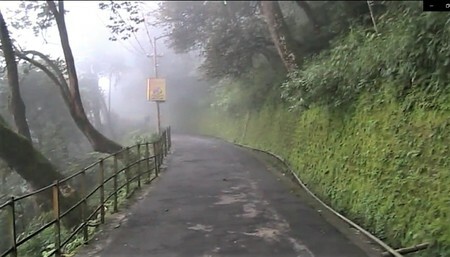 During monsoon time, the humidity in Darjeeling remains at its highest levels and can easily go past 90% of saturation. You should carry light woolens or warm clothes, particularly for the evenings and early mornings. So coming back to the original question... is it a great time to visit Darjeeling during monsoon? I would have to say it again... 'It really depends on eyes of the beholder'. 1) Check out Darjeeling Weather to know more about the weather conditions in Darjeeling and neighboring areas during the various months. I took your statement true that the trip to these parts in monsoons depends on the eyes of beholder. It was wonderful. We travelled in the third week of September. There were all kinds of weather that we experienced in a short time. Sunny, balmy, drizzle, mild to moderate cold and finally a memorable trip. Thanks a lot. First of all, I'd like to thank you for your informative, detailed and passionate writings on Darjeeling, which are very helpful for tourists. I'm very much thrilled and impressed after reading your take on the aforementioned subject. I'd certainly like to explore Darjeeling in monsoon for enjoying it's beauty. Now I'm troubling you with some queries. If you're kind enough to reply in email, I'd be highly obliged. 1) Does JOYRIDE remain open at all during late August, say 22nd? If open, is JOYRIDE steam a safe option in monsoon or should I opt for the diesel one? I mean, can landslides cause fatal accident there? 2) Tires of car tend to skid in monsoon. The journey to and from Darjeeling involves Zigzag roads. Which car should we hire to minimise this risk? Can landslide happen in front of us and large boulders thrashing our car? I may sound timid but my mother would be with me. Also, my uncle. I'm thinking of their perspective too. 3) For three of us, we want two beds in a room or two inter-connecting bedrooms. I'm not so high on budget to afford Windamere but I'm ready to spend my money if my mother and uncle are satisfied and if they can enjoy rain and lushes of green from their room's window or balcony, sipping a cup of Darjeeling tea. Also it must not involve steep walking because my mother is a patient of Osteo arthritis. If it's near Glenarys/ Keventers, that would be great. So can you think of some good choices? 4) You've already written about this, but once more I want to ask, is there a good Bengali nonveg restaurant in Darjeeling? In Shangri-la, dishes taste like North-Indian ones. I don't know what cuisine they serve as dinner in Glenarys because I'm yet to try. This question is particularly for my uncle, because he loves Bhat - Dal - Aluposto - Alubhaja - Machher jhol type Bengali food a lot. Is there a good option? Thanking you in advance and regards. Limited toy train joyrides operate even in monsoon unless there is some track repair work in progress. You can choose either of steam or diesel engine... has no correlation with landslides. A small car is good enough to reach Darjeeling town... the entire road is tarred. There are plenty of options for hotels... I have discussed the good ones in my site. If you are in medium budget, you can consider two upper-floor rooms (large rooms) in Darjeeling Tourist Lodge. You need to keep a car if you want to completely avoid walks on hilly roads. Also almost all hotels would have stairs to negotiate. Bengali food is best served in Mahakal Restaurant on Robertson Road, but may not still satisfy one who only seeks homemade traditional Bengali food. Hi Raj, Me and my wife are going to visit Darjeeling in 28th June. I know it's not a good season to visit. But, due to Eid holiday we chose this time. My question... is there any outdoor activities even if there is continuous rain? Hi, most tourist sites remain open in monsoon although it may not be always practical to visit some places when it's raining. Toy train too usually operates. Excellent article. It is scary as well as exciting. As you rightly said, whether to visit Darjeeling in monsoon or not depends upon the visitor's liking. Hi Raj, First of all let me congratulate you on the amazing job you have done with this blog! Superlative, and I think I've read each article several times :) Me & my husband are scheduled to be there from 15th Aug - 18th Aug, and trust me the choice to travel in the monsoon was a lot due to your article on it! So, after a lot of research we have shortlisted and checked availability for the following 3 hotels: - Villa Everest, Golden Heights, Broadway. Now, our requirements are clean rooms, good views (as it maybe raining a lot & we might have to be indoors), hot water & good breakfast. Would love to have your views on them and any other recommendation would also be very helpful! Waiting to hear from you soon! Thanks a lot! Hi Anindita, All the hotels you have selected are in my recommended list. Considering all your requirements, Golden Heights would be my choice. They have an excellent lounge and dining area where you can spend a lot of your time. The lounge and some rooms have good views too... but in monsoon do not expect any views of the peaks. Hi, It seems we will be going there during the unstoppable monsoon but it would be wonderful if you recommend us some outdoor activities (if any) if it rains all day long. We are prepared to go out in rain. If it keeps raining then rafting, paragliding etc are not possible. If you get a dry spell, it may be possible. When you reach Darjeeling, get in touch with the operator Offroad Adventures located by the Mall. They are one of the best in all these. You will find their details in my site. I must thank you for the wonderful article about Darjeeling in monsoon. Inspired from your writing, I spent about 10 days at Darjeeling, last July & it has been one of the best experience of my life. Had a great time, deep inside the tea garden & watching the rain gradually engulfing me. I feel Darjeeling is at its best during monsoon. Also had a great time enjoying Dalle Khursani, Squash & Carrots, & nothing to beat the early morning fresh Loaves from Glenarys, with Darjeeling Tea. Hi, Landslides are quite common in the hills during monsoon and they cause road blocks. While most times alternative routes can be worked out, some times you may get stuck in traffic jam for hours. However accidents in monsoon or those caused due to landslides are rare. Toy train is not running from NJP/Siliguri to Darjeeling since several years, although the damaged track is scheduled for repair soon. Landslides cause similar problems to rail track as well as both the main road (highway) and toy train track run side by side for most part. 3. Can you suggest certain places to visit during that time. I understand that the view of kanchenjunga will not be clear during that time. We have accepted that. 4. How high is the probability of landslides and us getting stuck there? Thank you in advance for your help. It means a lot. 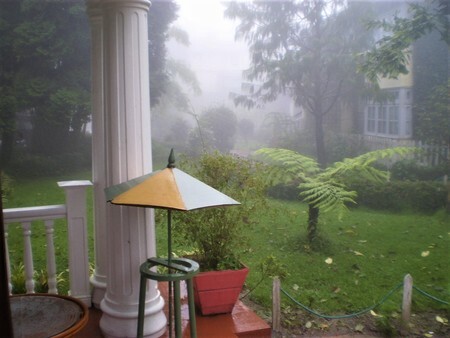 If you love the raindrops, lush greenery and the mist ... you must go. Check out the article 'Darjeeling in Monsoon' once again, I have recently added some more pictures of monsoon on request from other viewers. I hope you've read my detailed review of Central Nirvana ... you will know how I feel about the hotel. It's quite okay if you can take the 5-minutes downhill walk from the taxi point (and uphill on your way back). Keep in mind that after dark, this place is going to be completely desolate, although it's very close to the Mall. 1) Monasteries ... particularly Old Ghoom Monastery in Ghoom and on the way, Samten Choling Monastery. Landslides can take place although not very common. But mostly they don't pose much problems unless it's a huge one which is rare. In most cases alternative routes are available to reach NJP/Bagdogra. So chances of you getting stranded is slim. But do take enough buffer time (at least 2-3 hours) when you return just in case there is any delay along the way. Don't forget to carry large umbrellas.... you should enjoy the rains after all. Good Luck!! What do you say about a quiet monsoon trip to Darjeeling Hills. 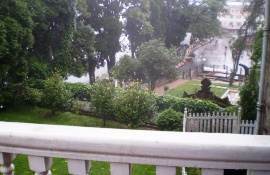 Is it worthwhile to stay 2 nights each at Makaibari, Selim Hill, Goomtee, and Chota Mangwa. Or 4 nights each at two places. What should our ideal Itinerary be? Do we get big discounts during monsoon period. We have limited funds, and must hire car from point to point. We are a retired middle-class couple in our late 50's. Seeking your advice. Regards. If you like lush wet mountainous landscapes and a quiet vacation without many tourists, you will greatly enjoy Darjeeling in monsoon. 2 nights in four places will make it too hectic. You can plan 3-nights each in a couple of Tea Gardens, and 2/3 nights in Chota Mangwa. You will need to organize the car transfers through the gardens. In Chota Mangwa, they will get a private car/taxi for you for a drop at the station/airport, but the charges will be higher than normal taxi rates. You should contact all the places and get a clear idea about the budget. Each place will offer all inclusive package including stay, food and some recreational activities. Thanks. In this context, out of the four tea gardens, can you suggest the best and reasonable tea garden accommodation that affords the best scenery even on a rainy day. Out of the tea gardens I described, Gelnburn would be most expensive but probably the best from tea tourism perspective (accommodation, natural beauty including forest & stream, food, staff, organized activities etc). Selim Hill, Goomtee and Makaibari are all in Kurseong area and offer nice views. Do ask for off season discounts. Makaibari garden workers offer homestays which are quite nice and cheap. They have extended/renovated their own homes for tourists. The rates include all meals. If you like such stays, you can even try that for a change. You will be close to local village families and learn about their lives. Some of such accommodations are in nice places with lovely views and have modern toilets etc.